As regular readers will know we are applying text-mining to chemistry in Open theses. The problem is finding fully Open theses – so far we have got Alicia’s. Alicia has captured all here molecules in semantic form so text-mining isn’t required – and I’m hoping to do some fun stuff with XML on it. I’ve searched for large collections of theses. MIT has a promising collection which would be ideal but they are only TollFree, not OpenAccess. I’m still appealing for readers to help. But in one of those quirks of Googling I ended up at the digital repository of the University of Stirling. Feeding behaviour of the prawn Macrobrachium rosenbergii as an indicator of pesticide contamination in tropical freshwater. the resulting work only under a licence identical to this one. other rights are in no way affected by the above. I convert it to ASCII using pdftotxt. This destroys the formatting, diacritics, tables, subscripts, superscripts – in fact almost everything except the words. And – for most theses – these are still in the right order. (Unlike Eric Morecambe, this is not a joke – PDF often has the words in an arbitrary order). I start OSCAR (http://oscar3.sf.net) as a Server and paste in the text. It takes about 30 seconds for OSCAR to read the whole thesis and interpret the chemistry. (This portable version of OSCAR does not have a complete lexicon – full versions need to be run on a server). 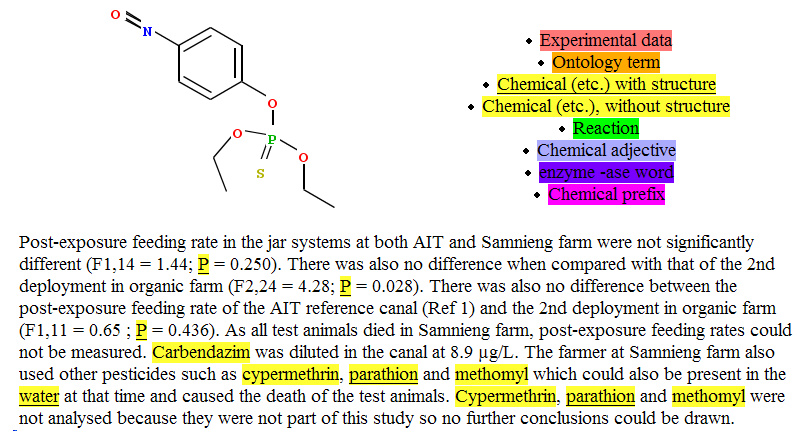 You can see that OSCAR has recognised many words as likely chemical terms (in yellow) and knows the structure of the underlined ones (the full version would know all of them). It’s not 100% accurate – you can see it thinks “P” is the element phosphorus – but Peter Corbett has addressed this in later versions. This entry was posted in chemistry, etd2007, open issues. Bookmark the permalink. Pingback: Scifoo day 1: Turn up, tune in, drop out « O’Really?